Babies have experienced 9 months of comfort in their mother’s wombs, the wombs providing them the warmth as they were developing and the rocking movement they experience as their mothers move along to do her duties. Alas, comes the time they are born to the outside world and the simple comforts they enjoyed while in mom’s womb all but have gone: the warmth and coziness, the rocking movement: even the once silent world now becomes a myriad of many different sounds. Thus starts the never-ending journey to bring back baby to his comfort zone. Infant-toddler bouncers are snuggle fit baby receptacles that are motion powered and may move or vibrate for some time depending on the force or “push” applied to the bouncer. In time, the reaction to the push lessens the movements of the bouncer until such time that the bouncer movement stops. Unfortunately, when the movement stops, the baby feels uncomfortable so that a push or movement of the bouncer is needed again. There are two types of infant rockers. The more known is the bassinet rocker, which is also referred to sometimes as a sleeper or soother. As the name connotes, this type of rocker may be used for overnight sleeping, being mechanically powered to create a vibrating or rocking movement to put the baby to sleep. The other rocker is the baby-sized rocking chairs which are mechanically powered. Though not meant to be used for overnight sleep, this type of rocker “grows” with the baby as it has a setting to allow for reclining of a new born as well as one which supports an upright toddler. Infant bouncers provide moms with some relief as when there is something that mom has to do and she has to put down her baby. The movement from the bouncer enables the baby to be rocked for a while so that the baby does not feel left alone. The bouncer also provides for a safe but not so expensive baby equipment that will enable the baby to stay comfortable for some time. Most of the best infant toddler bouncers are ergonomically designed to support the still developing skeletal system of the baby. Another thing going for the bouncer is that it does not have to occupy a big space so that small built spaces will not have problems with having one. Results of a study that was published on the motor development of infants who were allowed to use play-assist equipment indicated that motor development of infants who had prolonged use of this equipment showed lower scores on infant motor development as against those who had very little use of the equipment who scored higher on motor development. As there were no other tests done to corroborate this statement though, parents were just advised on the moderate use of the equipment at home. Aside from the propensity to slow down motor development when frequently using the play-assist equipment, babies who regularly use the bouncer become more prone to having flattened head syndrome, due to the baby’s sleeping on the side where he is most comfortable with considering that the bouncer’s design secures him to a half-lying, half sitting position. Also, as the bouncers are motion powered, babies who are awakened because of immobility of the equipment, try their best to have the equipment move so that they exert much effort if left unattended for periods longer than 20 minutes. Although parents should be wary about possible effects of frequent use of infant-to-toddler bouncers, we cannot deny the fact that the baby bouncer is still one equipment where mother and baby can benefit even given small periods of rest. The guiding principle should always be moderation in use and following safety and operational guidelines, i.e. use of the equipment only up to the allowed maximum age and only when the equipment is in good running condition. Care must also be taken that the equipment is used on even floor surfaces to prevent it from tumbling over which could hurt the infant. 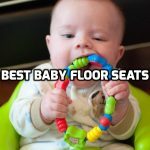 The following lists the 10 best infant toddler rockers and /or bouncers available in the market. I hope you will be able to find one that will best suit your and your baby’s needs. Fisher-Price Infant-to-Toddler Rocker, Geo Diamonds. This infant-to-toddler rocker comes with a geometric diamond patterned detachable machine washable pad that comes in a cool blue hue. It has a detachable bat-at entertainment overhead. You can initially use it as an infant rocker and then transform it to a toddler rocker as your child grows. This rocker can be effectively used for toddlers of up to 40 lbs. This baby bouncer from Fisher-Price is human powered but comes with a mechanically operated (1D battery) gadget that adds a calming vibration to the bouncer. It has a toy bar that the child can reach with his hands to encourage the development of motor skills and bat to develop eye and hand coordination. This infant-to-toddler rocker comes with a floral pink and orange design (but may be used for boys or girls). The rocker has a mechanically operated vibrating gadget which gives a calming effect (2C batteries). The rocker incorporates a removable toy bar with 2 animal bat-at toys. You can initially use it as an infant rocker and then transform it to a toddler rocker as your child grows. This rocker can be effectively used for toddlers of up to 40 lbs. This rocker is a favorite when it comes to being one of the best infant toddler rockers available in the market. This infant-to-toddler bouncer comes in 3 colors: pink, blue and red. The bouncer’s name may be attributed to the pinwheel-like movement of the animal toys that are attached to the toy bar which can actually be easily detached with one hand. The middle attachment of the toy bar is actually a mirror where the baby can enjoy watching his face as he happily reaches and bats at the 2 other toy animals. The bounder does not have an insert so newborns cannot readily use it. It would have to take at least 2 months before a newborn can use this bouncer. Although the batteries last a long time, it would have been better if the vibrating gadget would have a timer so that even if left open, the batteries would not be spent as much. This multicolored comfort curve bouncer from Fisher Price has multi-activity toys attached to its toy bar: a raccoon spinner and deer clacker ring toys. Baby will definitely enjoy the variety of activities he is able to do while comfortably snuggled in the comfortable seat while enjoying the soothing comfort from the bouncer’s vibrating gadgets. The baby would almost feel as if she were always cradled in her mother’s arms. Cannot be used by new borns. Had to be at least 2 months or 6 lbs. Bouncer does not recline but bounces back anyway. This equipment is an all-in-one play seat and sleeper. The seat material is made up of white, deluxe, plush fabrics, has a head support and an insert to accommodate new borns. The sleeper rocks back and forth with just a gentle push. The sleeper may be equipped with vibrating gadgets for a calming effect. Clackers are also provided to engage the bay in simple play. May be used by babies weighing up to 20 lbs. Should not be used anymore if babies start to stand on their own. This newborn-to-toddler portable rocker has adjustable features that enable it to work as a newly born rocker to a toddler rocking or stationary chair. The attached toys will definitely give the infant a great time of play what with its colorful pattern as well as variety in activity. The beautiful color of the equipment will be one the baby would want to grow up with as he graduates to a rocker sitting toddler. Can hold toddlers up to 40 lbs. This rock and play sleeper mimic the soothing comfort savanna grasslands are known for. The turn of a switch provides a calming vibration that soothes the baby to sleep. This plus the comfortable incline of the sleeper makes for undisturbed rest for the baby. The plush head support and baby insert enable the use of the rocker/sleeper even by a newborn. It is a sleeper and playtime seat in one. The sleeper was designed for a newborn; ergo, the mat and insert are such that they keep the baby warm. Thus, for a baby who is more than just a newborn, this might result to profuse perspiring as the bigger infants would not want as much warmth. it makes sense to get a mechanically operated rocker/sleeper as manually having to rock the sleeper gets in the way of having a peaceful and restful sleep, especially for the mothers. The Bunny infant-to-toddler rocker is surely one rocker that your baby can grow with. Initially, it can be used as a reclining seater for feeding the baby, then as a rocker/sleeper, and eventually a rocking chair for the grown toddler. The toy bar (which may be detached during sleep) has bat-at toys (flowers and butterflies) which the child can play with. It also has a musical butterfly that can stimulate the child’s listening skills. Proper use of equipment should be followed. Some users reported that the parts seem to separate from the sides after quite some time: this could either be because they may not be very particular about the weight requirements or the equipment has received a banging from its users: this equipment is plastic and can only take on so much weight. Had the user limited the use to children within the allowable weight requirements, then the separation problem might not have happened. The preceding review had presented to you the best features as well as the “quirks” of each of the different styles of the best infant toddler rockers and bouncers available. 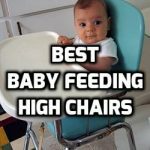 Although there may seem to be very little difference among the features of some equipment, still, these differences have to be taken into consideration when selecting the best infant toddler bouncer or rocker for your child. Rocker attributes like leg room, incline, ability to keep your baby asleep, and motivation provided to improve motor development are just some of the factors you might take into consideration. But of course, the best person to judge which best infant-toddler rocker or bouncer to use is your baby!